You are warmly invited to our Prep School Open Morning on Saturday 10th November at 9:45am. Guided tours start at 10:00am and there will be a talk by the Headmaster at 11:15am. After the talk, you will have the opportunity to chat to Paul Stanley, the College Bursar, and members of the Prep School Senior Management Team. 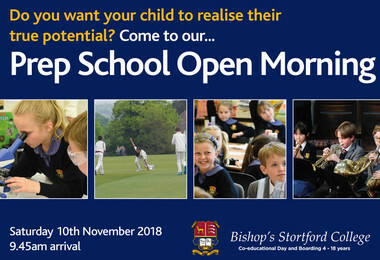 The Prep School Admissions Officer, Mrs Brett and her colleagues will be on hand throughout the morning to answer your questions and give you our latest information. Whether visiting for the first time, or returning to see more, this is the ideal opportunity to have a look around the Prep School and soak up the atmosphere. Please park in the Prep School car park entrance off Maze Green Road. The Sat Nav postcode for the Prep School car park is CM23 2PH. For more information about the Prep School admissions process please click here.